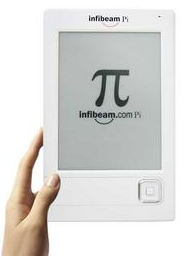 A company in India, Infibeam, has introduced Pi, an e-ink based book reader for the Indian market, with support for local languages and a very Kindle-like look. Lesser base storage than the Kindle, but you can extend the memory with an SD card. It can read PDFs, ePubs, HTML, DOC, JPG and some other stuff, which is awesome. Doesn’t have a keyboard though, so while you can bookmark stuff you can’t make notes; which is a bit unfortunate. Like the Kindle, it can play MP3s. It has a built-in version of Sudoku, and they claim they’ll add more apps. Given the price (10K, lower than the Kindle), and the reading culture in India, I wouldn’t be surprised if this becomes a decent hit. I love the Indian language support, which the Kindle lacks. If you go to the link, they show a mixed-language book with both English and Sanskrit text. They claim to carry 100,000 books for now, which is a goodly number, given that the Kindle, introduced long ago, so far carries about 400,000. I’m not sure if this comes with a built-in cellular data connection like the Kindle, but it doesn’t really matter. I’ve always thought that was a bit of an overkill, I’m happy to sync a book reader via my computer for purchasing books. I wonder if someone couldn’t produce a cheaper version of this for the poorer schools in India which have such a hard time providing access to books. Yes, 50 of these would be very expensive compared to buying 50 books — but you can just have 50 of these in a class and every student of every grade and subject could use exactly the same device in the classroom. Lots of saved paper, and maybe saved money in the long term too. This was written by Anshul. Posted on Friday, January 29, 2010, at 1:54 am. Filed under Uncategorized. Bookmark the permalink. Follow comments here with the RSS feed. Post a comment or leave a trackback. Local language support is definitely the killer feature of this product. I expect it will be a while before poorer schools in India have access to this, but definitely a feasible idea there! I stopped following Kindle when I found out that you have to pay them money to have your PDFs converted to Kindle readable format. I find it great that I can copy and read all my papers and pdf ebooks without a hassle. Btw, do you know a reliable way to convert djvu to pdf? …and the website says that they have a search feature inside documents. They must have a digital keyboard. Wonder if they let users take notes too. Namit: Amazon has updated Kindle firmware to allow native reading of PDFs. I can simply transfer over any PDF onto the Kindle via USB and it will read it. As for conversion from djvu to PDF, any reader that can print djvu documents can be used along with PDFCreator for Windows, or native support for PDF printing in Mac/Linux to convert to PDF.